The high-end sewing and quilting machine. The heart of the BERNINA 7 Series features a novel, centrally placed driver, which allows the BERNINA Hook to run fast yet quietly. The BERNINA Hook sews high-precision stitches up to 9 mm in width with speeds up to 1,000 stitches per minute. The bobbin holds up to 70% more thread than standard bobbins allowing you to sew longer without interruption. The BERNINA 7 Series includes a meticulously engineered extended freearm with 10 inches of space to the right of the needle. 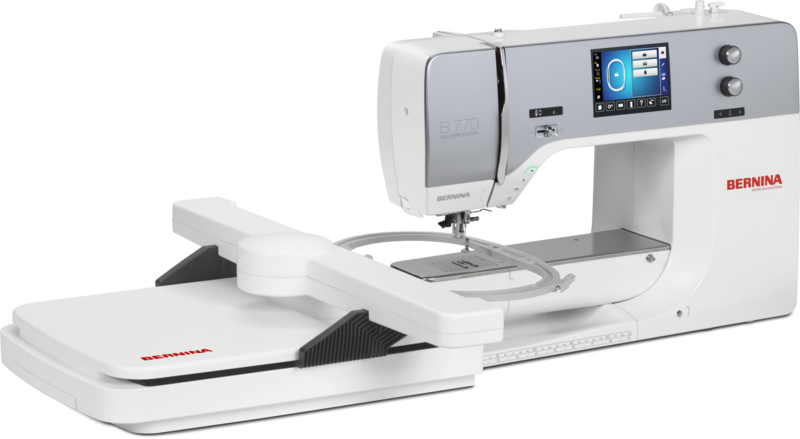 The BERNINA 770 QE not only provides plenty of space for large, beautiful sewing and quilting projects – with its stitch width of 9 mm, it is also ideally suited for sewing decorative stitches. The extra-large embroidery module (optional with the BERNINA 770 QE) lets you stitch out maxi-sized motifs. And should your ambitions grow, the BERNINA 770 QE can be updated with a wealth of accessories. Embroidery module included: An embroidery module turns your BERNINA sewing machine with embroidery capability into an embroidery computer. The embroidery module turns embroidery into a simple task and provides breathtaking results. Embroidery work can be readily completed within the large embroidery area provided by the embroidery module L. The embroidery module L is compatible with BERNINA 7 Series and 8 Series sewing machines.